All Things Brantley, All Things Tribe: Brantley's On the Cover of Sports Illustrated! Brantley's On the Cover of Sports Illustrated! what a great shot. it looks like Michael was having genuine fun at the photo shoot and they got him in the middle of a hearty laugh, which i love. i'm even shocked--and pleased--that the photog, Robert Beck, managed to get a smile from the normally stoic Klubot. said Michael, "they took so many pictures, i couldn't tell you what we were laughing at. we took serious pictures at the end, but i guess they didn't use those. i hope the fans like the picture, because i don't know how many more smiles like that that they're going to get. i think that's why they had to use that picture. it might not ever happen again." Michael added, "to be on the cover with somebody like Corey, who works so hard and is such a great teammate and person, is an honor." now, now Cleveland fans. 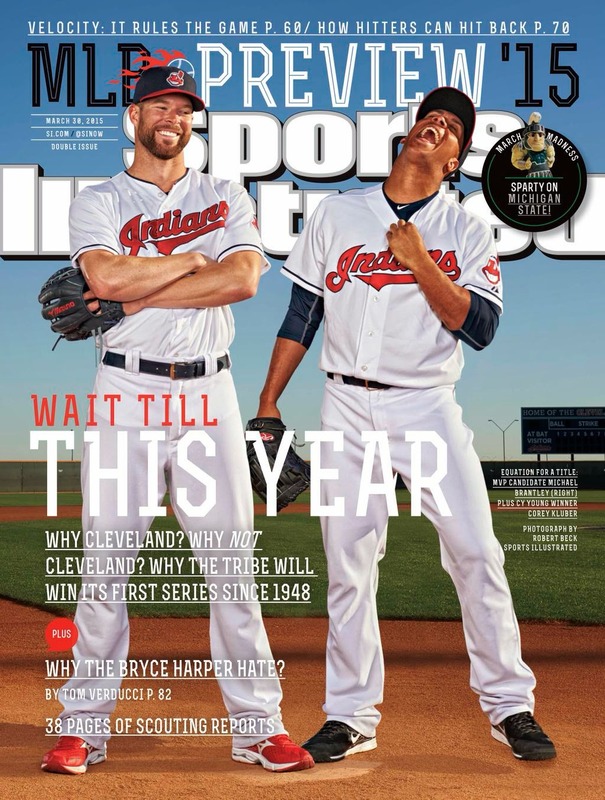 i am well aware of the Sports Illustrated Cleveland jinx. i know how Cory Snyder and Joe Carter graced the cover in 1987, when SI declared the Indians as the best team in the AL and the favorites to win the World Series. and i know how the team finished that '87 year with the worst record in baseball, going 61-101. and i'm sure those memories make some Tribe fans uneasy. luckily, our guys don't seem to be fazed by it. hell, half the team wasn't even alive when that 1987 issue came out. Michael, who was quoted as "somewhat" believing in jinxes, said, "i don't know the SI jinx. i've never heard of it. i don't want to hear about it." okay, but maybe he should still bone up on a little Tribe history, just for educational purposes. when Corey was asked if he believed in the cover jinx, he simply replied, "i don't." and manager Terry Francona, who is not a stranger to curses in baseball, said, "i told people in Boston, i didn't think it was a curse. i thought it was lack of pitching." at least he kept it real. and logical. let me also add though, that there is a difference between this SI cover and the one from 1987. this time, the Indians are just 1 of 4 teams that the magazine showcased in its 2015 MLB Preview. while magazine cover distribution is based on your specific local area, all covers and team stories are available right at your fingertips thanks to the world wide web. click here to see the other 3 team covers of the Washington Nationals (featuring Bryce Harper and Max Scherzer), the Kansas City Royals (featuring Salvador Perez and Greg Holland), and the Seattle Mariners (featuring Felix Hernandez and Robinson Cano). congratulations to our cover boys, Michael and Corey, and Go Tribe 2015! shout out and thanks to Jordan Bastian and Paul Hoynes for providing me with the quotes used here as well.